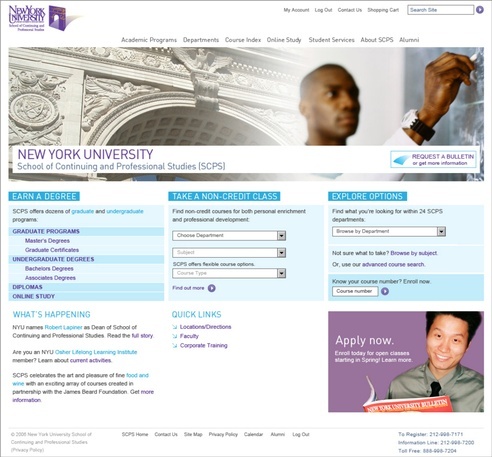 Widely known for one of the most respected post-baccalaureate continuing education programs in the United States, School of Continuing and Professional Studies (SCPS) has transformed itself into New York University’s fourth largest graduate school and fifth largest undergraduate college. SCPS offers 14 distinct master’s and 26 undergraduate degrees in subjects ranging from applied income real estate property valuation to Arabic, from hospitality industry investment to digital filmmaking, from credit analysis to arts appraisal, to programs that address global human trafficking or explore the American dream through literature and cinema or New York’s urban landscape. Nearly 4,000 courses, lecture series, and conferences are offered on SCPS’s website within a renewed information architecture and design.